It was a long search finding the perfect fine mesh strainer that is well constructed and made of stainless steel...but our efforts "finely" rewarded us when we procured this Italian-made, sleek, well constructed utensil. We highly recommend this tool for filtering out the smallest particles as we use it at our home to clarify our vinegars when they have collected a bit of sediment or some of the "mother" forms. 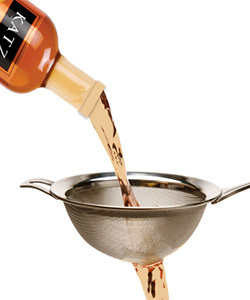 Just decant through the fine mesh into a measuring cup, clean the bottle with some warm water, and then pour back in the vinegar ; also ideal for tea straining, getting cork out or decanting wine. A must have for the kitchen...why not add one to our Carriage House Box to enhance your gift.